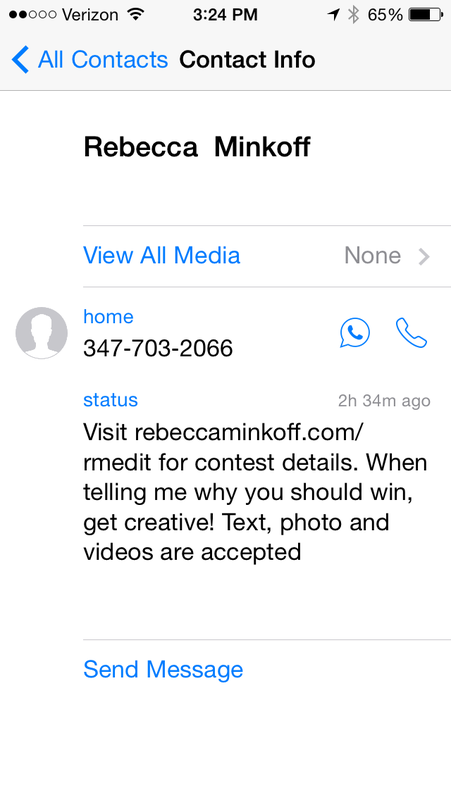 I certainly haven’t seen this done before – Rebecca Minkoff is conducting a giveaway contest exclusively via What’s App and Snapchat. 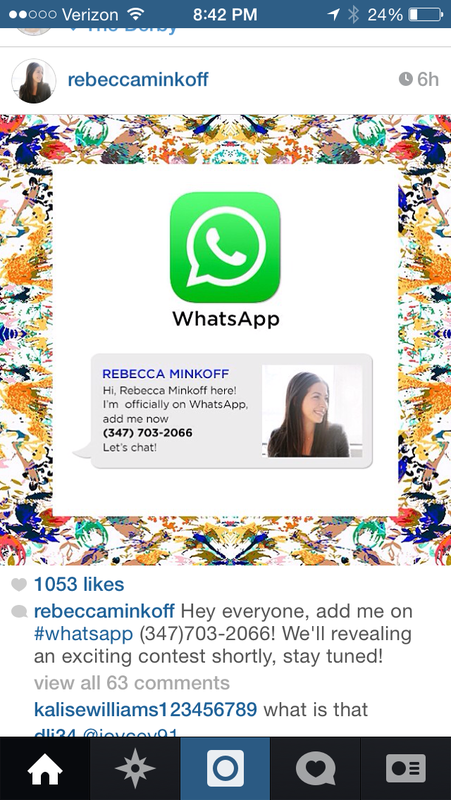 I first came across this on Instagram, where Rebecca Minkoff has 362,000 followers and posted the below image. The contest only lasts one day (today, June 3). 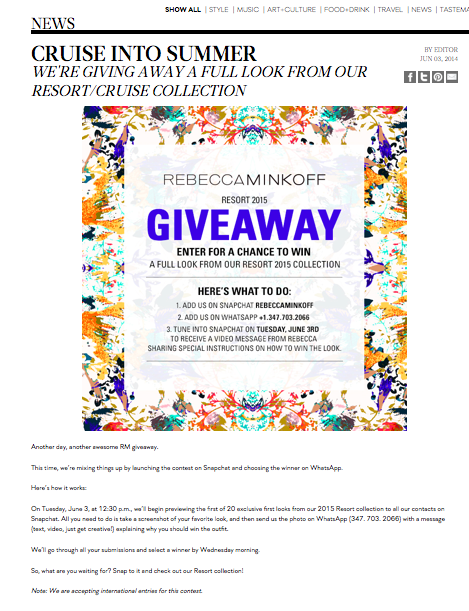 During the narrow time window, entrants must go to Snapchat to review the Resort collection, take a screenshot of their favorite shot and message it to Rebecca via What’sApp with why they want to win it. This is one of the more intimate ways I’ve seen a brand interact with their followers. I imagine that everyone who enters via What’sApp gets a personalized message back from “Rebecca Minkoff” (really her social media team) which is a very high-touch approach. 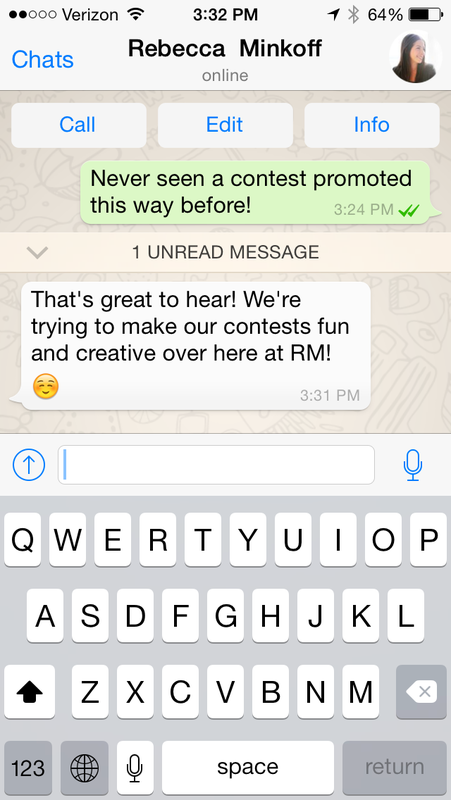 Although there are a lot of steps involved in the contest…those who enter are certainly engaged customers! Has anyone else seen a brand do a giveaway like this using What’s App or Snapchat? 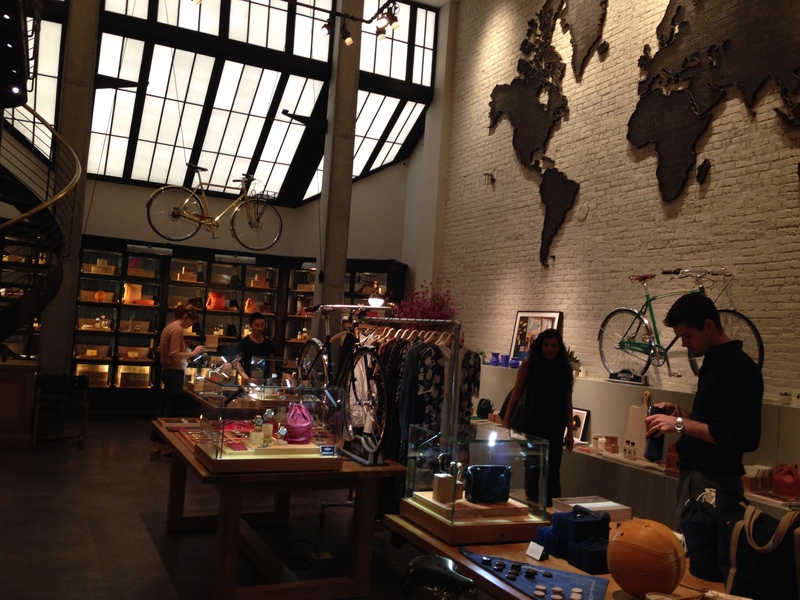 Last week, I finally went to the Shinola store in Tribeca. For those who are unfamiliar, Shinola is a luxury watch brand based in Detroit, Michigan. They embrace U.S. based manufacturing and are helping to revitalize the Detroit economy, while providing an exceptional product to customers. They are getting quite a bit of press and attention recently. My brother, Michael, now works at their corporate HQ, so I am definitely biased and have personal ties to the company, but I think they are doing some impressive work! 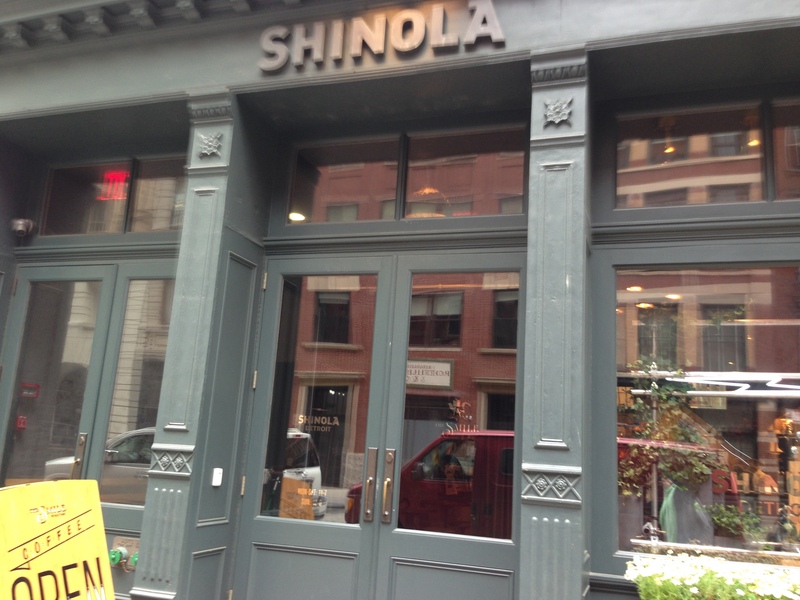 Currently they operate Shinola stores in NY and Detroit and are slated to open a bunch more this year. Their products are also carried by a number of retailers like Neiman Marcus, Bloomingdale’s, Saks, Nordstrom and many many more smaller retailers, boutiques and jewelers. 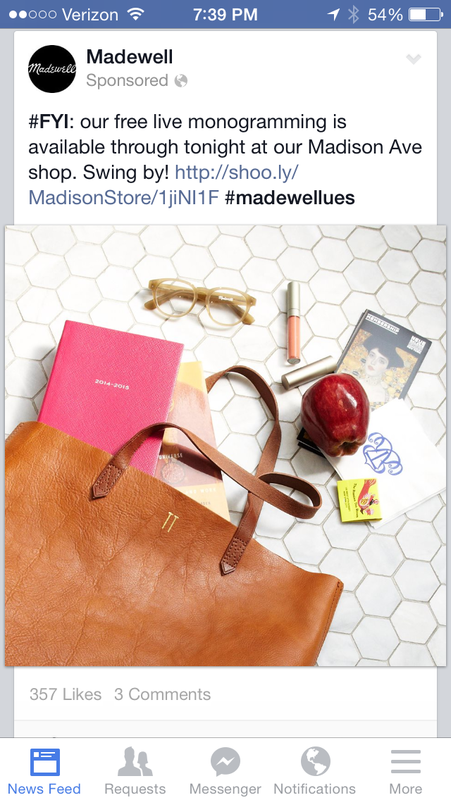 They also have their own e-commerce site, shinola.com. 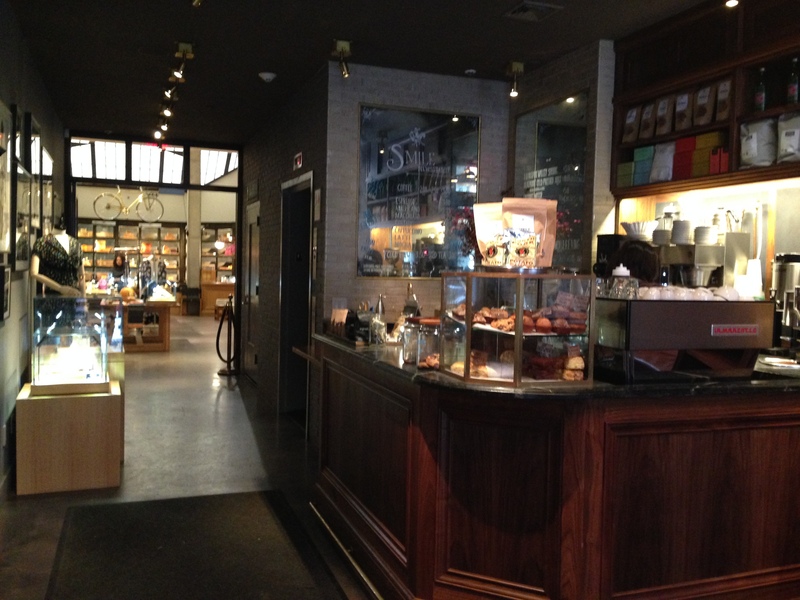 Then, the store itself has super high ceilings and feels very open, like a lofty space. They have NY corporate offices that are actually upstairs from the store. It conveys a feeling of hipness, yet in a warm and not offputting way. There are bikes hanging in various spots and interesting displays of both Shinola merchandise as well as other brands that are curated — all are items manufactured in the U.S.A. with a similar aesthetic and sensibility. The store kind of felt like being a museum with interesting things to discover and explore around each bend. I was greeted very quickly upon entry by two of the sales associates who spotted me wearing my “Mini Runwell” watch and struck up conversation right away. Jocelyn was incredibly charming, warm and nice and spent a lot of time with me, showing me around the store and sharing the back-story of various products and tips about the watches and bands. She showed me the women’s watches along the back wall and helped me try on a bunch of colors of The Birdy, which I am eying as my next Shinola purchase. I then wandered the store myself and decided to purchase a few journals. I went to check out — which is also nice they just use an iphone type set-up and don’t have a monstrous check-out kiosk/counter. Instead it felt really seamless and pleasant. Jocelyn then asked me if I wanted the journals monogrammed (a complimentary service) and I was so excited and thought this was super unique! 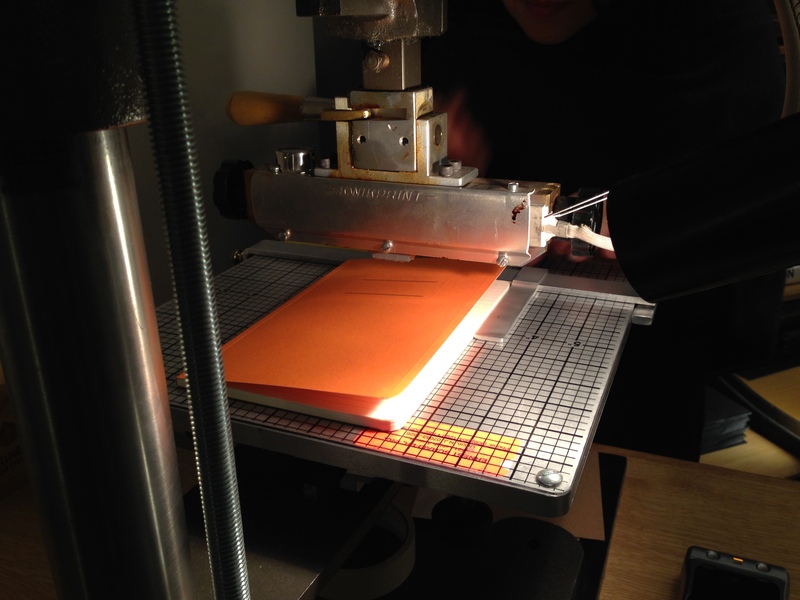 So, I then watched her put them through a huge machine, akin to a letterpress machine. She did two for my husband (RSF) and two for me (TLF). I got to choose whether I wanted gold vs. silver and the size/placement of the lettering. It was a really unique process to watch and to be part of the “making” of these products, staying true to the Shinola spirit. Overall, my visit was much more of an ‘experience’ than just ‘transactional’ focused. I left feeling so intrigued by the brand, and re-energized that physical retail stores really CAN have value-add and create interesting experiences rather than just be a nuisance… (I so often prefer to shop online that I often dread setting foot into a real store – too often the sales people and environment can be a turnoff or let-down). – Without my new “friend” Jocelyn to show me the ropes, I may have missed the women’s watches myself, particularly if I was doing a quick pass-through the store. At first, I only saw the men’s watches on the center table. This may be intentional on their part — I am guessing a much larger % of their business is Men’s watches, or perhaps they think that women troll the perimeter of a store more and uncover items more easily. But personally I almost didn’t see these! – Speaking of mens vs. women’s, I thought the whole store has more of a Men’s vibe to it. (This isn’t a bad thing). Just interesting to me to observe how a store that appeals/sells both genders skews male in feeling (darker colors, bold boxy letters, more mens merchandise, etc). Probably more important to attract rather than turn off men, while women who wear Shinola are more “downtown” in aesthetic and comfortable in these types of environments / don’t need super feminine touches. 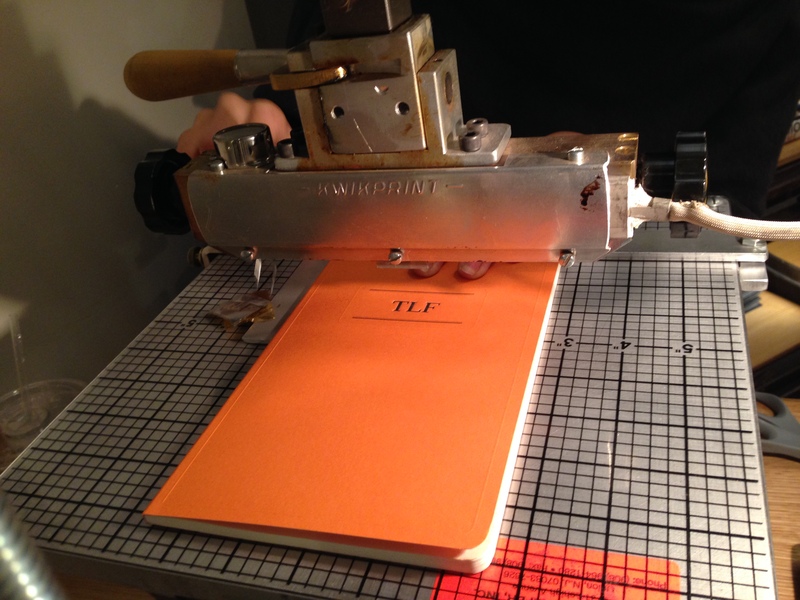 – I thought the monogram services are actually a big draw and could be promoted to encourage the purchase of journals (or other items too)! 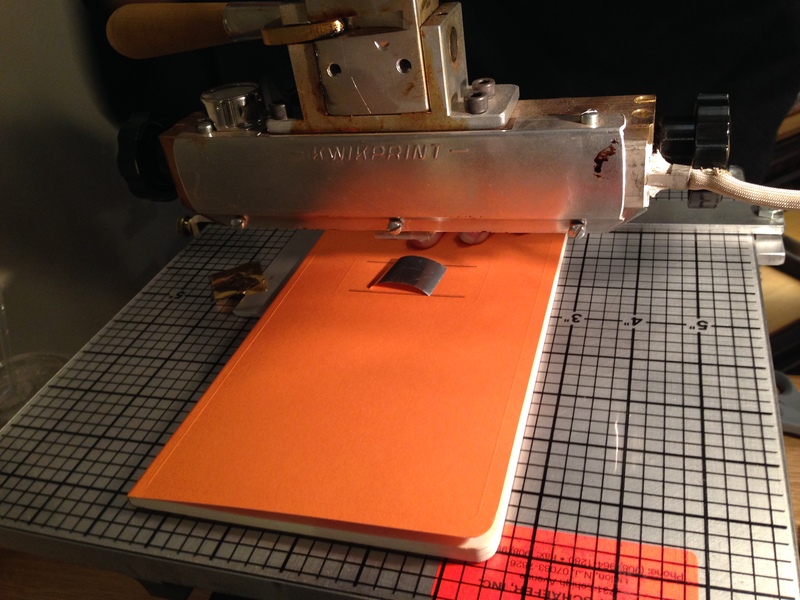 I think there’s opportunity to visually display journals with initials on them near the blank ones so customers can see this is possible to have done. (Right now, the salespeople just told me about it, or I wouldn’t have known). I think this tactic may be intentional so they don’t get over-run and can control when they offer the service (not mention it if they are too busy at the moment, and make it seem like more of a “secret” giving you a feeling of being an insider when you are offered this service)… but I think it would be excite people by showcasing it more prominently and possibly result in more journal sales. 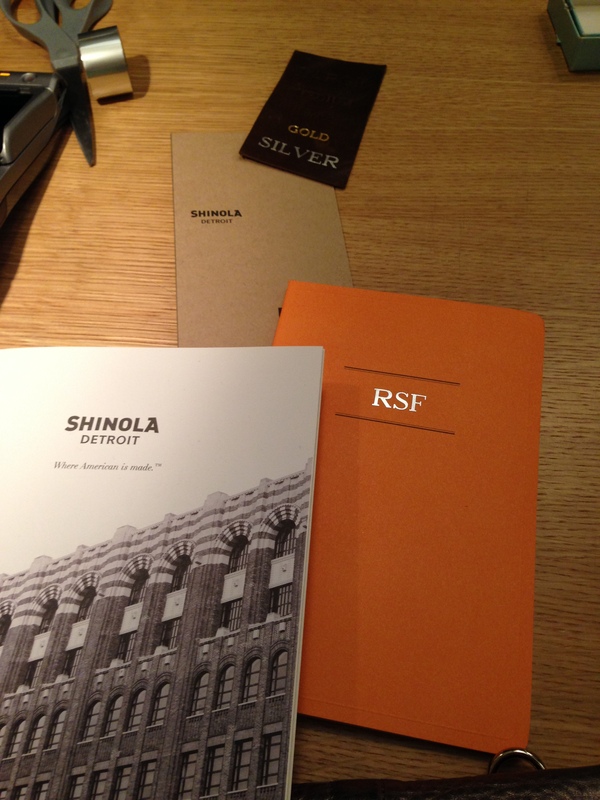 – Lastly, Shinola has the bones of a great e-commerce site. Pretty easy to navigate, clear descriptions, vivid imagery and is a great start. However, I do think there’s opportunity to do even more storytelling and weave in more editorial on the site. When you click “our story” for instance, you can watch a video, but it would be nice to have a written story too if you aren’t in the mood for watching a clip. Some of the great press stories would be nice to include and highlight. I could also see opportunity to showcase how real people (customers) are wearing their Shinolas — so others can get styling ideas from their photos. Shinola includes this regularly on Instagram, but it would be cool to incorporate this imagery on the site itself. Lastly, featuring some of the amazing work and partnerships they are doing in the city of Detroit, like the clocks they have around the city. All in all though , a fantastic and impressive store experience and I was excited to share! I feel like all too often, retailers say “free shipping” but when you read the fine print, what they really mean is “free shipping over $50” or something similar. 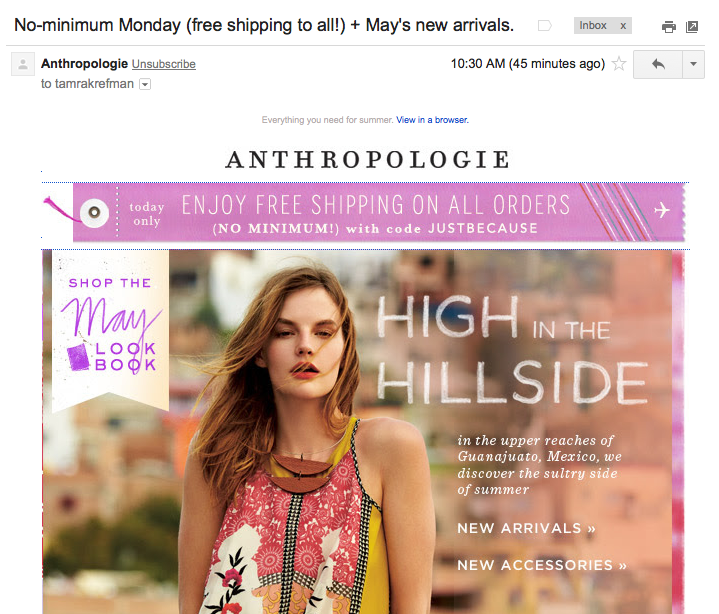 I liked that this promotion was pretty straightforward and a simple execution (small banner within email and on site), and I thought the way Anthropologie framed this was quite clever. The corresponding code they included “JUSTBECAUSE” was also very cute. 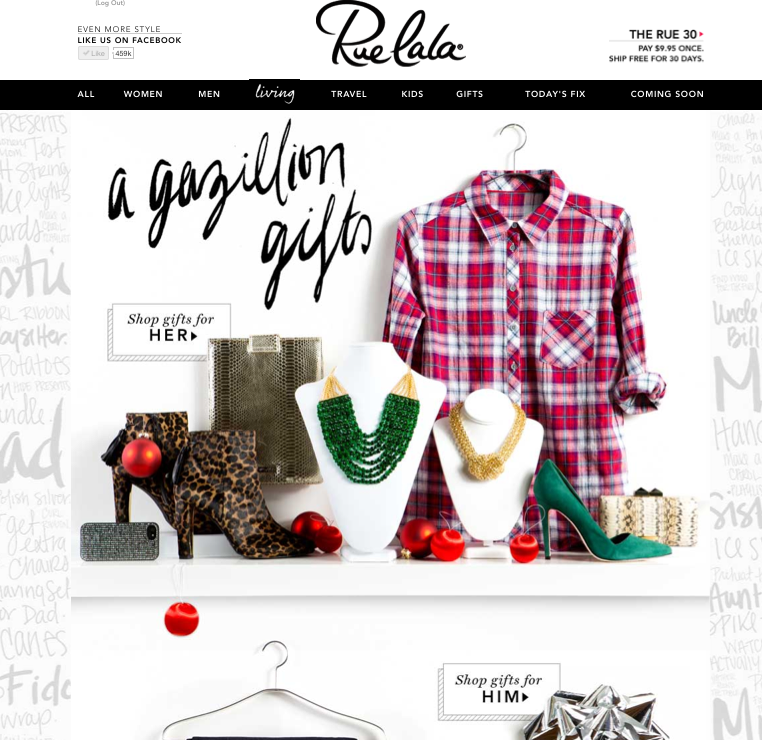 Rue La La created holiday capsules on the Gazillion Gifts part of their site in a super creative way. 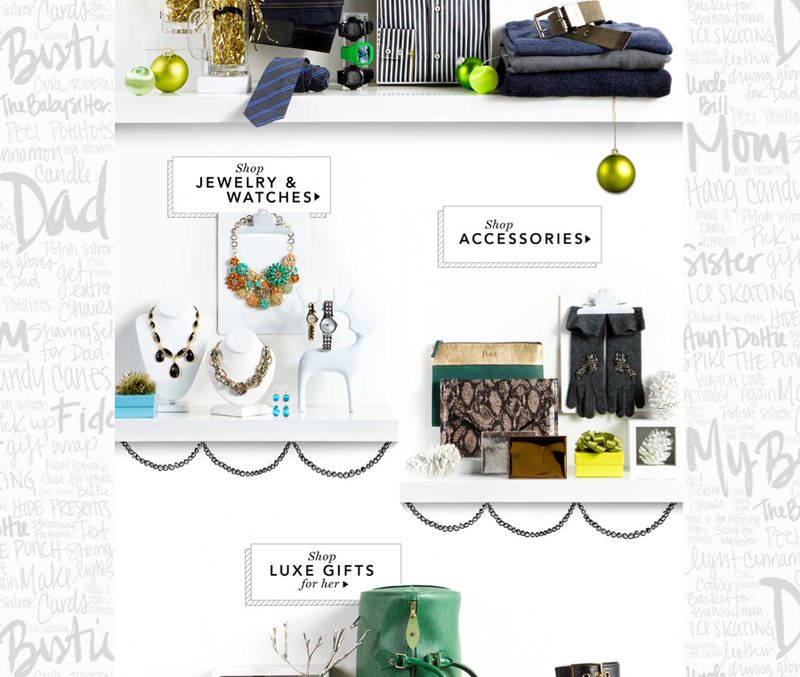 I love the combination of hand-drawn illustrations, typed banners/signs, real merchandise, props and photographs of gift wrapping elements like bows, ornaments and gift boxes with ribbon. 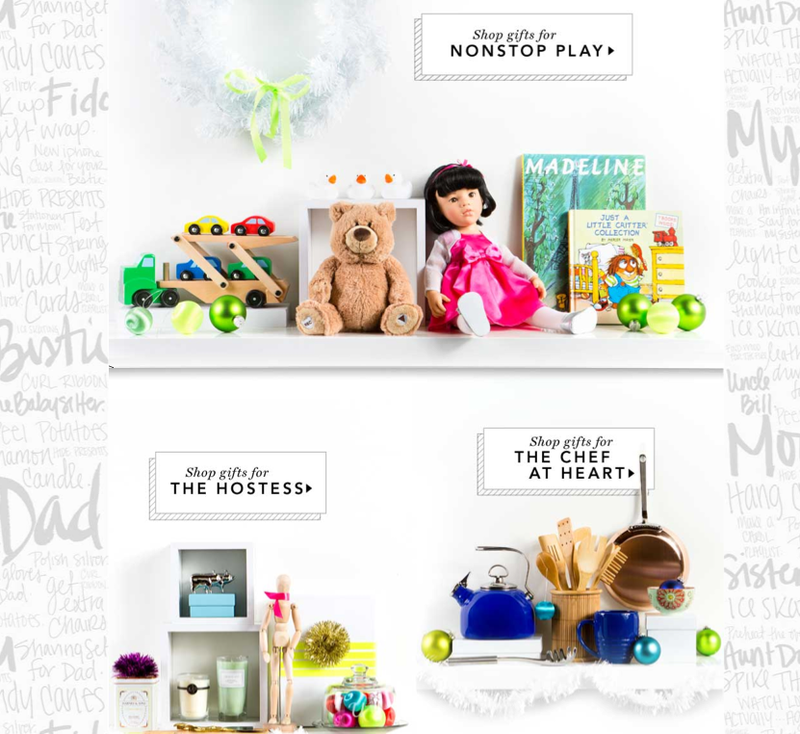 The way they styled these capsules and pulled the page together really brought forth feelings of whimsy and and a warm festive vibe. It feels like you’re in a boutique store with white walls, practically getting to touch and feel the display. Nicely done! 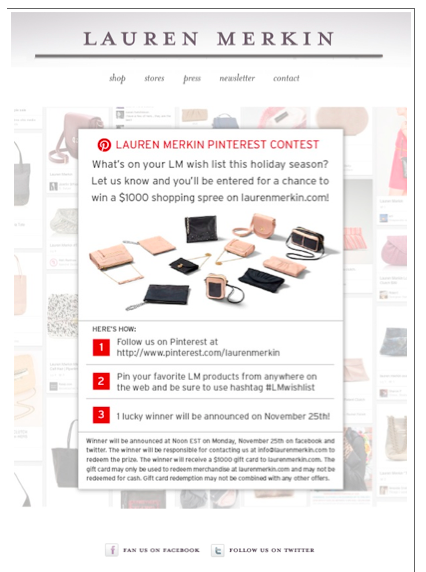 I received the below email yesterday from LaurenMerkin.com, announcing a Pinterest sweepstakes. I’ve seen a number of brands conduct Pinterest sweepstakes/contests, and this stood out to me in a positive way as one of the cleaner and easier implementations for users to understand what is required of them. I particularly liked the way they broke it down into simple steps/directions for users to follow. All too often, I’ve seen brands include paragraphs of text, where users really need to focus and digest the instructions. Lauren Merkin made it clear and straightforward as to what is required to enter. My main suggestion to improve this communication would be to add a prominent call-to-action, like a “go now” or “enter now” button that links to their Pinterest page. Currently if you click the image, it does link there, but this isn’t readily apparent. 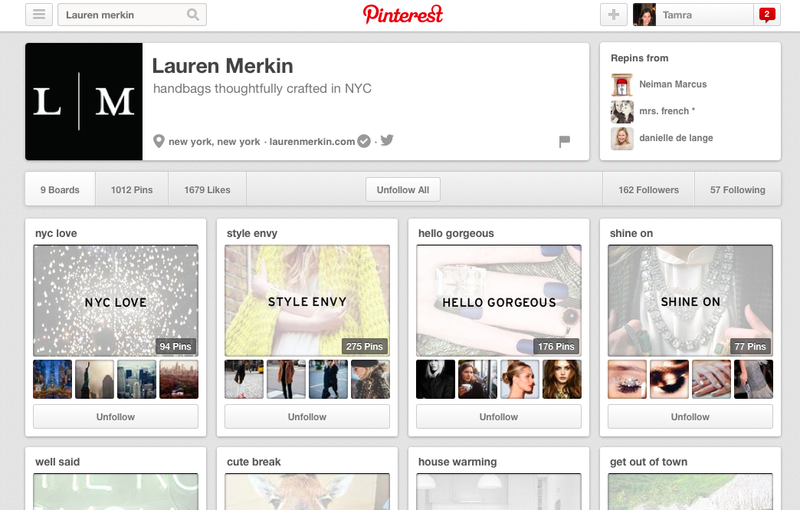 Lauren Merkin’s account does pin quite a bit (1,000+ pins) and have adorable cover photos for each of their boards, but it looks like their Pinterest offering is in its infancy (under 200 followers). I am under the impression that this promotion is an attempt to spark growth in their # of followers. 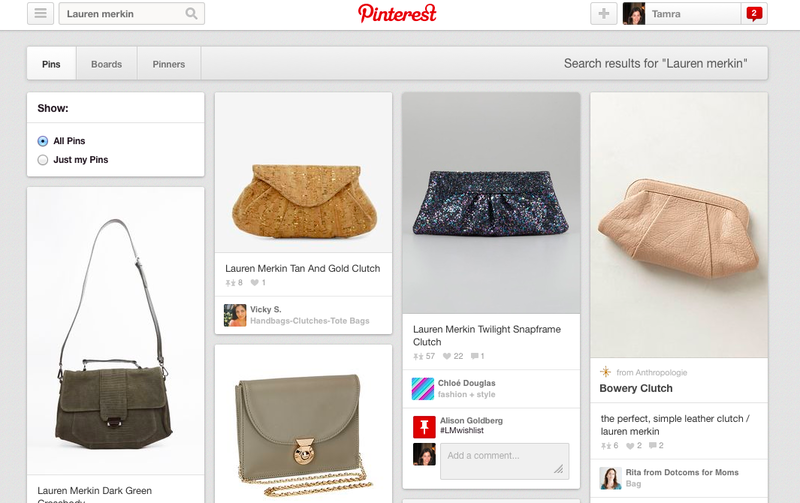 This is likely important for them during the holiday season since it’s so widely reported that Pinterest is effective as a channel for retailers to generate sales. I’ll be curious to check in a few weeks and see how effective this was for them in terms of new follower growth. 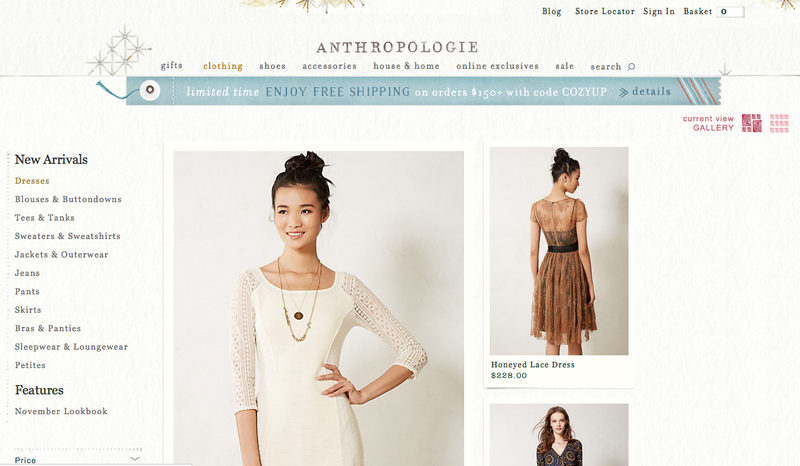 I was just on Anthropologie.com and noticed that they’ve made their product pages similar to Pinterest in the look and feel. They’ve walked away from a standard grid format, and the default styling is now a staggered approach more encouraging of constant scrolling and discovery. 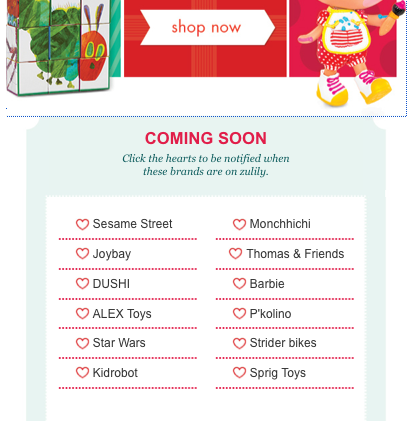 They give consumers the option to revert to a standard grid format in the top-right corner. 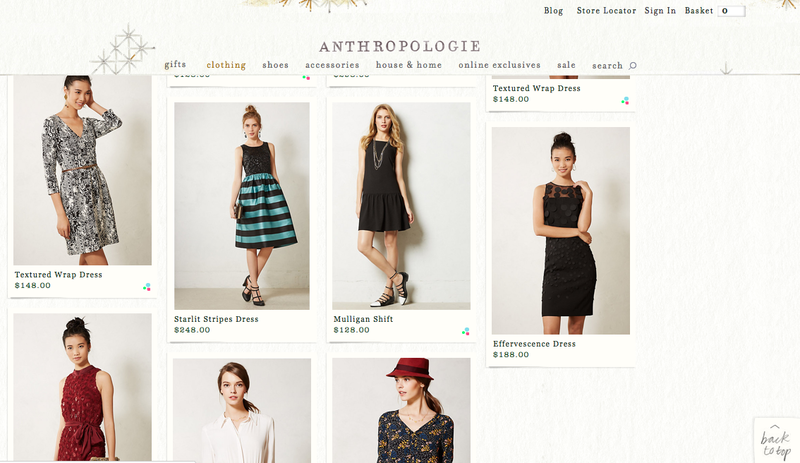 I wonder if they are A/B testing each layout as the default to see which results in more clicks and purchases. If not, I’d encourage them to do so! I would be so curious as to the results. 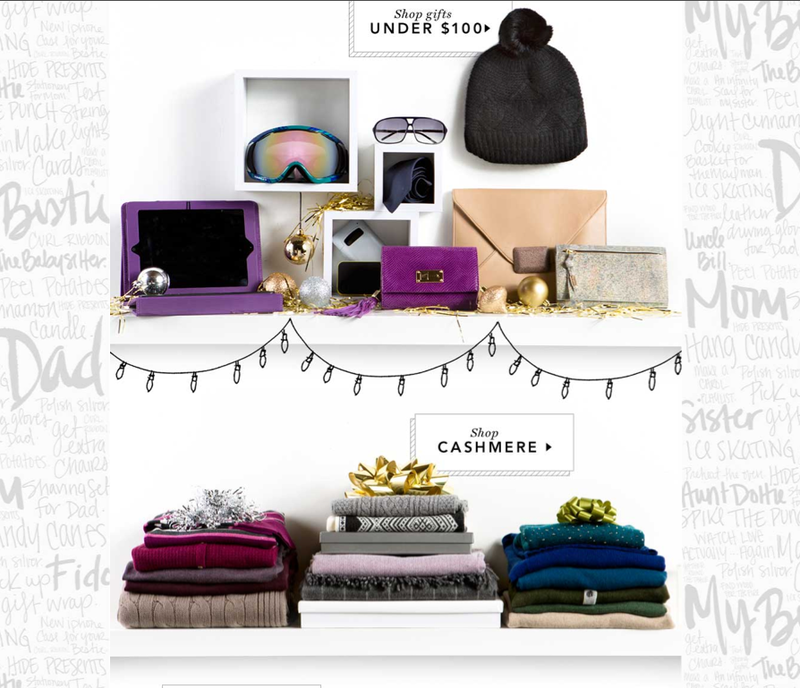 I’ve seen lots of aggregator sites mimicking the Pinterest approach (Lyst, Styleseek, etc), but I haven’t seen individual retailers employ this technique on their site. I wonder how effective it is.